Ahh notes. It doesn’t seem to matter how organized we get or how much we document information, we always need to take notes. Whether they’re on sticky notes, tablets, chicken-scratch on our hands or whatnot, note taking is something everyone does. 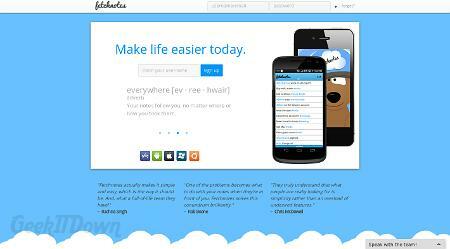 Fetchnotes is note-taking from your computer, mobile device and the web. Note-taking apps are plentiful in the app markets. There is a real need for just the right combination of simplicity and organization. Some have extended features and are truly robust, while others focus on the idea of simple mobile note-taking. Fetchnotes is a cross between the two. Fetchnotes is accessible from anywhere which means taking and syncing notes is wildly convenient. With the use of login credentials, Fetchnotes is able to keep your notes up to date so that they’re easily retrieved even if operating on a different platform. Fetchnotes keeps things simple by not predefining categories, rather instead utilizing hashtags (#) as a way of tagging notes for search and retrieval. The web interface is clean and easy to operate. The mobile interface is a little different than the norm, but we didn’t have difficulty adjusting. Fetchnotes is still progressing so we expect an expansion in features that could create some competition for the more robust note-taking apps. That’s a long way off from now, but as it stands Fetchnotes is a great note-taking alternative that syncs across devices and organizes notes your way according to hashtags.